Improved liquidity, better financial and business-wide reporting and decision-making, are just some of the more tangible benefits of business management software. Implementing software is always a big decision for any firm especially in a time of economic hardship. As things show signs of improvement, firms can look beyond this and plan for the upcoming future. By facilitating joined up thinking, technology can empower you to stay ahead of competitors. 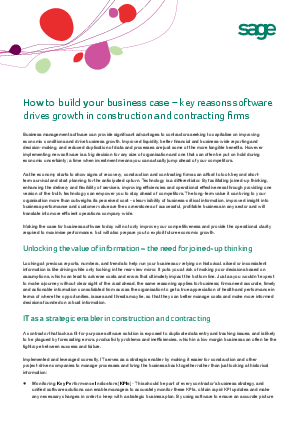 This white paper gives you key reasons software drives growth in construction and contracting firms.